I have begun setting realistic monthly sewing goals to allow me to organize my thoughts and successfully sew more! This month I have set a goal of 4 garments: 2 for myself and 2 for my girls. I was able to finish one of them for myself during Selfish Sewing Week! Woohoo! A little history before I begin with my Selfish Sewing Week garment. I have made a few tops for myself over the last couple of months. 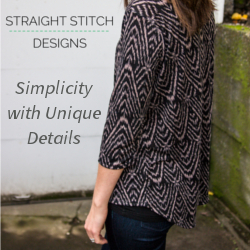 One of the common threads in these patterns is that they need no fitting whatsoever beyond general measurements. This really has been to psych myself into sewing for myself again. I’d really hate to sew something for myself that doesn’t fit and looks atrocious. I might end up putting it off again, and I don’t want that! 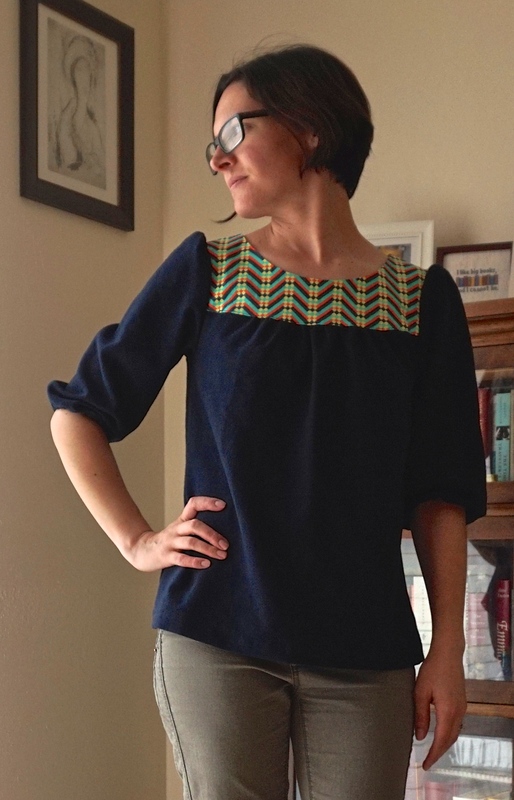 The first top I made for myself in December is the Turnabout Blouse from Modern Praire Sewing by Abigail A Long. 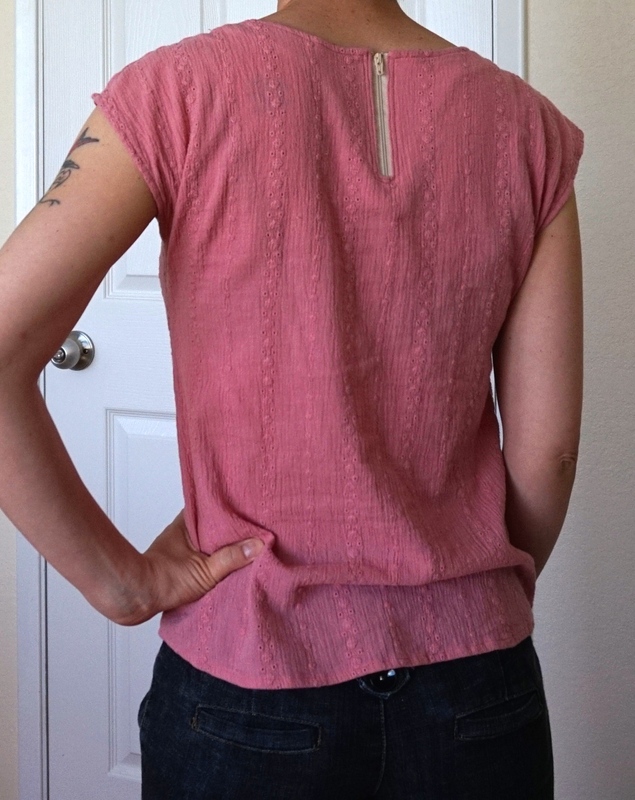 A vintage inspired blouse that is so simple to sew (the back and the front are exactly the same! ), I found it a lovely pattern to begin with and ended up using one of my favorite stashed fabrics! 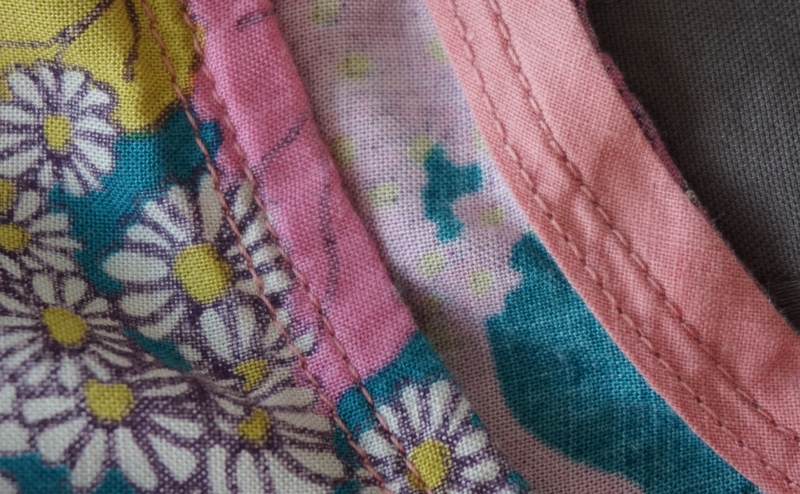 It’s a rayon challis from Joel Dewberry’s Bungalow collection called Dainty Daisies in Lavender. 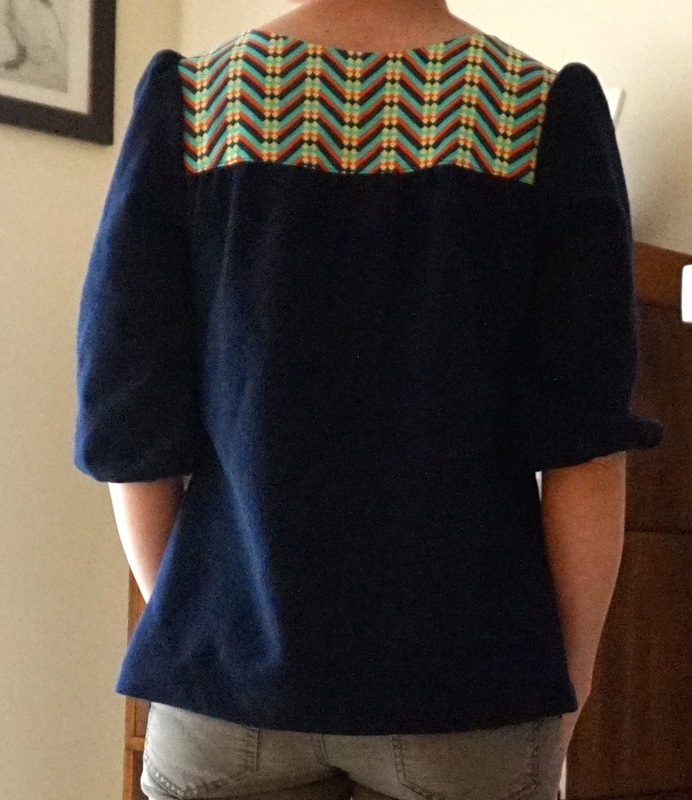 The neckline is finished with vintage bias tape. I want to say it shrank a little when washed too. Overall, I like this top, but I probably won’t make another one. I’m just not crazy about the fit. 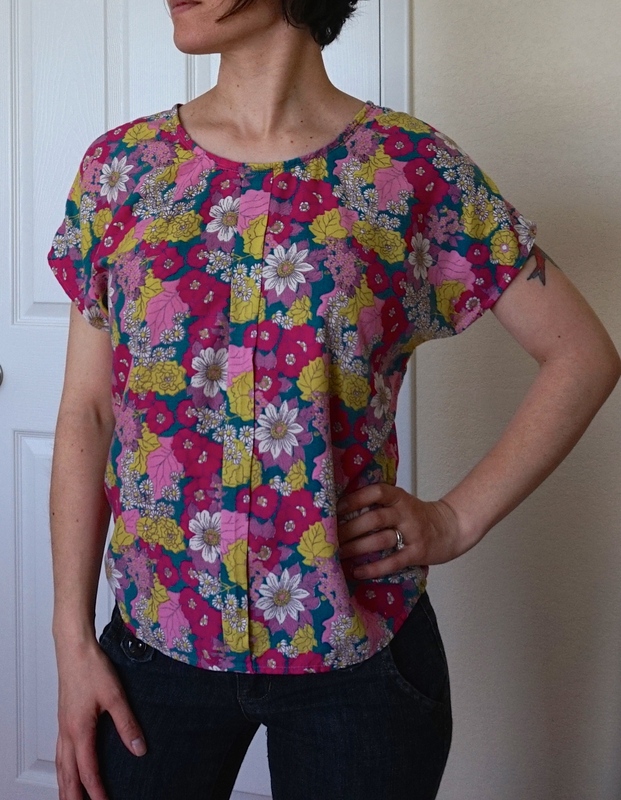 The second top I made for myself in February is the Zippy Top by See Kate Sew. I’ve made these for my girls, and I just love the simplicity and shape of this top. Again, I used one of my favorite stashed fabrics for this simple blouse as well. It was a remnant from Britex Fabrics. I believe it’s cotton, has eyelets, and a crinkled texture that stretches a little. It looks amazing after wearing it all day at work too! I love the little zipper detail, but to be honest, between the stretch and wide neckline, I could’ve skipped the zipper if I wanted to. I will definitely be making more of these. I have the perfect Crepe de Chine I’m going to try out next. The third top I made during Selfish Sewing Week, I decided I wanted to be a little more “demanding” (aka has sleeves). I absolutely love Made By Rae‘s patterns. She is incredibly detail oriented, provides every tiny little instruction you might need to complete one of her patterns, and provides the most helpful hints. 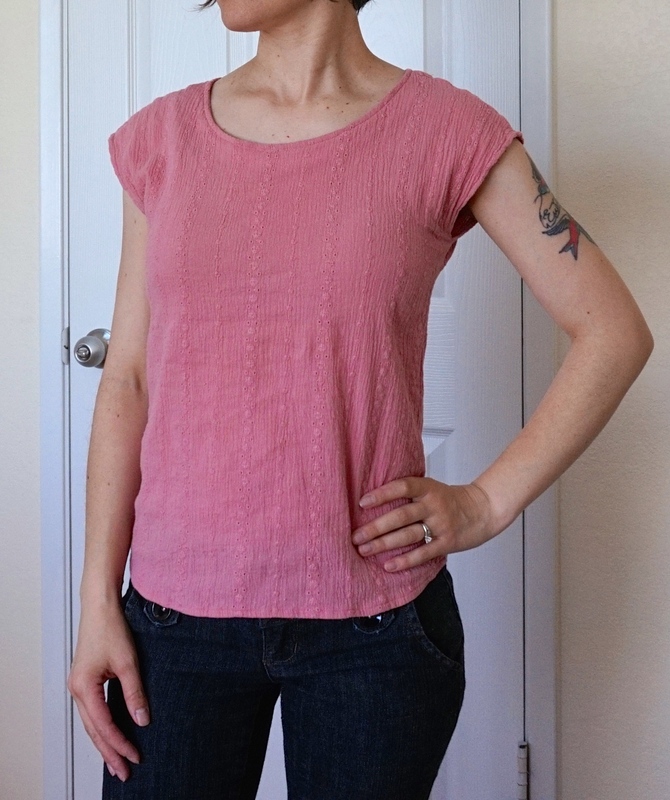 With that in mind, I decided to make the Ruby top with 3/4 length sleeves. In order to do this, I used her Ruby pattern with the Washi Expansion Pack. I already had these from an amazing sale she had last year, and we all know I have a weakness for indie pattern sales! I bought this geometric fabric by Amy Butler called Glow Waterfall Zest on a whim because I loved the color combination, but it’s so busy, I couldn’t decide on how I wanted to use it. It has a nice smooth feel to it and a nice drape. I also had some leftover blue wool fabric from my knot bags. It’s very soft and not at all scratchy, and I thought it would be nice and warm but not too stuffy. It was pretty simple to sew, and I love the way it turned out! After looking at this photo of the back though, I’m wondering if I need to make an adjustment to the upper back…or maybe it just needs pressing…fabric stiffness…my angle…I’ll have to try it on and take another look. So far I’m enjoying making clothing for myself! Now onto a vintage boatneck top!